Complete Lineup For The 13th Annual Holiday Wassail Announced! What’s better than a stack of presents under the tree? 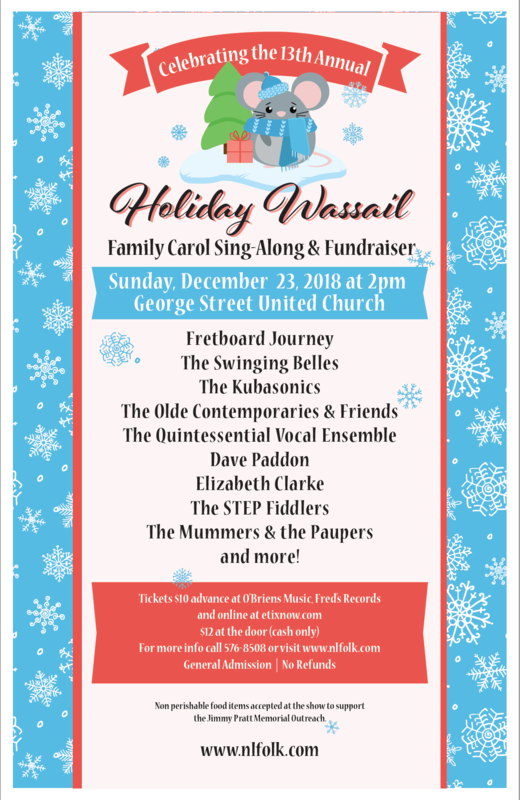 A stacked lineup for The 13th Annual Holiday Wassail! Check Out The Lineup, and click on each Artist/Group to learn more! Fretboard Journey, out with a brand new holiday picks album. The Swinging Belles, ready to raise our holiday spirits! Kubasonics. Ukrainian Christmas is it’s own special event and they know how to bring it! Old Contemporaries and Friends, are a handful of master musicians gathered around one microphone in the old style. Elizabeth Clarke, one of our young artist discoveries from this year. The STEP Fiddlers, will raise their fiddles for the intermission of the Wassail! and the Quintessential Vocal Ensemble will be a grand finale! We have been hoping to get them back for a while and so pleased schedules worked this year. The show will have a short intermission with refreshments (proceeds to George Street United’s Jimmy Pratt Memorial Kitchen) and NLFAS and artist merchandise (and raffle!) will be available as usual. Of course, we always have room in our event program for those who wish to take out a small sponsorship! Call 576-8508 or email events@nlfolk.com for details. Tickets are available at O’Brien’s Music Inc., Fred’s Records and of course, Folk Night and the office and for those that wish to purchase online, you can do so at the ticket link in this event. Box office fees will apply of course.